Lightly grease or spray a 9x5x3-inch loaf pan with nonstick cooking spray. Set aside. In a mixing bowl, stir together the flour, sugar and 1/2 cup cheese using a fork, make a well in the center and add the beer, stir with fork until well combined. Scrape batter into the prepared loaf pan, sprinkle top with the remaining 2 tablespoons cheese. Cover with plastic wrap and set aside while the oven preheats. Once oven is heated, bake the bread for 30 to 35 minutes, or until golden and loaf sounds hollow when tapped. 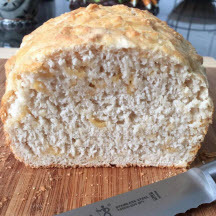 Immediately remove bread from pan (run a knife between the bread and pan for easier removal) and allow to cool for at least 10 minutes on a wire rack before slicing. *Regular Budweiser beer does very well in this recipe.